Absence makes the heart grow fonder. And in this case, a little jealousy doesn’t hurt either. 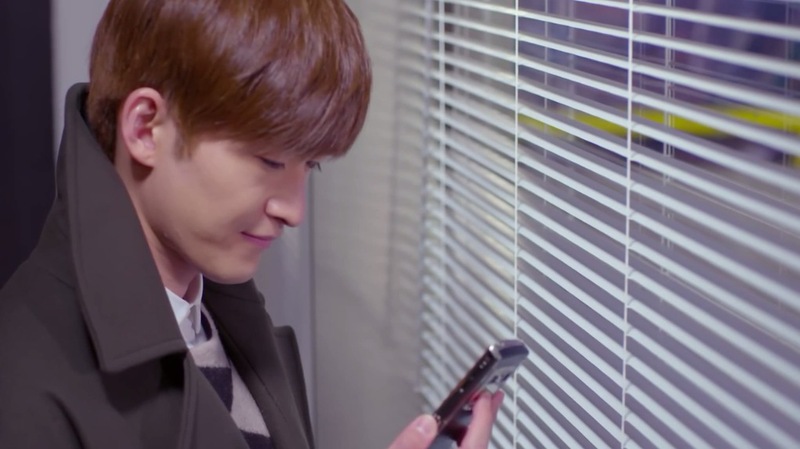 A new girl at work and a few unreplied text messages has Shan Shan thinking that maybe she does like Feng Teng. Finally! About time, don’t ya think? Now, please just start dating for real, so that we can witness more of that Shan-Teng adorableness. After all, there’s no one that can brush hair off her face more swoon-worthy than him. While Feng Teng is in Korea to negotiate for the acquisition of the KM company, Shan Shan disobeys his orders to stay home to rehab her sprained ankle. On her first day back at work, a new employee shows up at the Finance Dept. to replace that previously mean girl that always talked down to Shan Shan. Although first impression of this new girl is that she’s not going to be that much better. A quick gossip session between the coworkers reveals that the new girl was personally recruited by the company. The question as to who recruited her remains unanswered though. I don’t trust her bangs. Nowadays, Shan Shan has become pretty tight with Feng Yue and Li Shu, and frequently hangs out with them at their bookstore. Keep your friends close and your love rival even closer, right? Feng Yue reveals to them that she’s pregnant again, and Shan Shan promises that she’ll wait on standby in case she’s need some of her blood again. What a good friend! When Feng Yue’s husband comes to pick her up, he mentions to Shan Shan that he and Feng Yue are looking forward to going back to Europe since they haven’t been back in two years. Shan Shan is confused by this because Feng Teng had told her that Feng Yue was in Europe a little while ago when she had asked him to ask her to stop giving her the lunchboxes. She wonders to herself if he had made up that Europe lie on purpose to prevent her from speaking to Feng Yue about the lunchbox issue. Did he want to keep having lunch with her? Obviously! On the drive to work the next day, Shan Shan asks the Feng family’s chauffeur if Feng Teng is coming back to Shanghai/Windgroup today because he sent her a text last night to be ready to greet him in the main lobby. The chauffeur tells her that he hasn’t heard anything about Feng Teng being back, so he’s probably not there. But then Shan Shan sees Zheng Qi at work, meaning that the negotiations in Korea must be over. Even though Zheng Qi is indeed back, Feng Teng is nowhere to be seen. The manager of the Finance Dept. tells them that the company is being audited, so there’s a bunch of work they need to prepare for that. Hearing about the audit, the employees start whispering amongst themselves about rumors of problems that Windgroup is having. Shan Shan overhears some people talking about how the plans to acquire KM failed, and that it was a major setback for Feng Teng. In fact, they say that Feng Teng was so disappointed by the failed negotiations that he made Zheng Qi come back to China first, and that he’s still hiding somewhere abroad by himself. When Shan Shan runs into Zheng Qi at work, she asks him if it’s true about KM and if he knows when Feng Teng will be back. Zheng Qi confirms the rumors that she’s heard, but reassures her that Feng Teng will be back soon. He explains that the disappointment of not acquiring KM really affected Feng Teng, and that he’s just spending some time alone so he can recover from it. Despite hearing from Zheng Qi that Feng Teng will be fine and back at Windgroup, Shan Shan continues to think about him constantly and wondering about his well-being. When she texts him updates about her ankle, there are no responses. Maybe his phone ran out of battery? Did you check his social media? First thing in the AM. After a few Feng Teng-less days at Windgroup, all of the staff receives a text telling them to meet in the main lobby at 1 PM. When everyone is gathered and wondering what’s going on, Zheng Qi steps forward to announce that Windgroup has successfully beaten out an American company to acquire KM. Say what?It turns out that Feng Teng has been abroad this entire time dealing with the business negotiations, and they had purposely spread rumors about their previously failed negotiations to keep this business deal a secret. When Shan Shan sees that Feng Teng has returned, she tears up. Tears of joy, for sure! And Feng Teng purposely lingers a few seconds longer in front of Shan Shan when he’s walking past all of the employees. Linger as long as you want, sir. The next day, Shan Shan wakes up feeling sick but decides that it’s just a common cold and she doesn’t need medicine. During her lunch/study period, Shan Shan falls asleep while studying. Feng Teng smiles to himself when he sees her napping, and lets her keep sleeping. When lunch is over, he goes over to wake up but finds her unconscious. He realizes that she’s burning up and immediately calls for a doctor. The doctor tells him that she has a fever, and will get better with rest and medicine. Shan Shan continues to sleep for the entire afternoon, while Feng Teng is watching over her. When she finally wakes up, she immediately gets scared that Feng Teng is going to yell at her for sleeping on the job. Instead, Feng Teng is only concerned about how she’s feeling and tells her not to worry about anything but getting better. Shan Shan doesn’t try to argue with him, and goes back to sleep. She thinks about how she dreads going to Feng Teng’s office every time, but if she doesn’t go, then she finds herself a little disappointed. You so like him, Shan Shan! At work the next day, the coworkers are doing what they do best: gossiping in the kitchen. Shan Shan overhears them talking about how the new girl left work with Feng Teng is his car yesterday. WHAT?! Shan Shan immediately begins to imagine the two of them acting super flirty and Feng Teng taking her out on a date. The jealousy doesn’t lie! Her coworker tells Shan Shan that they heard they only left together because Feng Yue had a miscarriage and needed a lot of blood. It just so happens that the new girl had the same rare blood type as her. Shan Shan later finds out from Li Shu that Feng Yue did suffer a miscarriage and is not in any harm, but just isn’t ready to see anyone yet. Relieved that Feng Yue is doing alright, Shan Shan then wonders if that means the new girl has replaced her as the “blood bank” for the Feng family. At first, she’s glad that she won’t have to accept the lunchboxes anymore and be Feng Teng’s food-picker-outer, but then is pretty disappointed that Feng Teng has picked someone over her. Is this our last lunch together? Before Feng Teng came back from Korea, Shan Shan’s coworker friend tells her that everyone knows about how she donated blood to Feng Yue, and that’s why she’s friends with the family. She then tells her that she thinks Feng Teng must like her based on how concerned he was during the company excursion when she was missing. Feng Teng asks Zheng Qi what he’s missed while he was in Korea, and Zheng Qi tells him that Shan Shan must have been thinking about him a lot during that time. He says the fact that Shan Shan teared up seeing him should be reassurance that she cares about him. While Shan Shan ponders if she has been replaced by the new girl, she asks her roommate for advice on the situation. But instead of saying that she’s talking about herself and Feng Teng, she disguises it as a story she made up, where she’s a pig and Feng Teng’s a wolf. After hearing the story, her roomie tells her that the pig must be in love with the wolf. Well, that’s the cutest pig & wolf story I’ve ever heard!